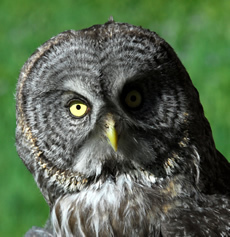 The Great Gray Owl (Strix nebulosa) (GGOW)is the world’s largest species of owl by length (not by weight, that goes to Great Horned Owl and its relatives). It inhabits the boreal climatic zones (subarctic ecosystems, also called taiga, with trees that are mostly coniferous) of North America and Eurasia. In North America, it breeds from central Alaska and Canada south to central California, the northern Rocky Mountains, northwestern Minnesota, and south-central Ontario. It winters mainly in its breeding range, although it wanders south irregularly into the northern US. Great Gray Owls are year-round residents in Wyoming, primarily in the mountainous areas in the western third of the State. The abundance of the Great Gray Owl is unknown in Wyoming and it is listed as a Species of Greatest Conservation Need in Wyoming and as a species with too little information to know how they are faring. Thus, studying the conservation genetics and population health of the Great Gray Owl in the Greater Yellowstone Ecosystem will help us understand the owl’s nesting ecology, seasonal habitat placement, evaluate prey consumption, and follow individual owls to better predict where they can be found throughout Wyoming. In California, Great Gray Owls are listed as a State-endangered raptor that is distributed in the central Sierra Nevada and new subspecies from the work in the Ernest Lab, Hull Lab, and UC Davis Wildlife Museum. Despite California State-endangered status, GGOWs had previously received limited research attention and had significant scientific data gaps exist regarding information necessary to formulate comprehensive and scientifically-defensible management and monitoring strategies. With other research groups, we worked to fill those gaps. The core breeding distribution of GGOWs in California is centered on Yosemite National Park and the immediately adjacent and surrounding Stanislaus, Sierra, and Sequoia National Forests, with a few additional documented pairs in Sequoia-Kings Canyon National Park (Winter 1986, Rich 2000). Available evidence indicates that GGOWs have a very limited and isolated distribution in California. The California population is the southern-most population in North America, with the closest known breeding population occurring in southern Oregon (Bull and Duncan 1997). With geographic isolation of the GGOWs in the Yosemite region, it is important for conservation efforts that the central Sierra Nevada population of GGOWs were determined to be genetically distinct from other populations of GGOWs and warrant greater conservation attention than before. 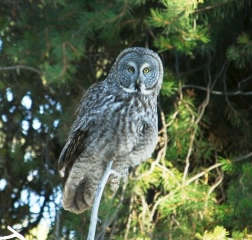 A new subspecies of Great Gray Owl (Strix nebulosa) in the Sierra Nevada of California, USA. J. Hull, A Engilis, J. Medley, E. Jepsen, J. Duncan, H. Ernest, J. Keane. 2014. Journal of Raptor Research.48(1):68-77. Winter Distribution and Conservation Status of the Sierra Nevada Great Gray Owl. Jepsen EP, Keane J, Ernest HB. 2011. Journal of Wildlife Management. doi: 10.1002/jwmg.239. Range-wide genetic differentiation among North American great gray owls (Strix nebulosa) reveals a distinct lineage restricted to the Sierra Nevada Mountains. Hull JM, Keane JJ, Savage WK, Godwin SA, Shafer J, Jepsen EP, Gerhardt R,Stermer C, and Ernest HB. 2010. Molecular Phylogenetics and Evolution. 56:212-221. Development of 37 microsatellite loci for Great Gray Owls (Strix nebulosa) with cross amplification in Spotted Owls (Strix occidentalis) and Barred Owls (Strix varia). Hull J, J Keane, L Tell, and H Ernest. 2008. Conservation Genetics 9: 1357-1361.